Based on last month's vote to limit the number of meetings we will hold in 2018 our December meeting will be the last one until February 2018. Join us this coming Thursday, renew your membership, and help us celebrate the history of Oak Lodge. This meeting will be another opportunity to renew lapsed memberships, and because no one has yet come forward we will be accepting nominations for OLHD Co-chair. This is a 2 year term. We will also have committee updates, and if time permits we will take a stroll through the OLHD Digital Archives. Please send me your requests for items to be placed on the agenda by Dec. 11th. Our November meeting will be a continuation of our October "Annual Meeting" when we re-elected our Treasurer and solicited nominations for Chair and Co-Chair. Thus far no one has come forward to serve as Chair or Co-chair and we need to fill those positions. We'll also be discussing numerous subjects that came up at our last meeting, including options for membership renewals, by-laws, volunteer tasks and others. 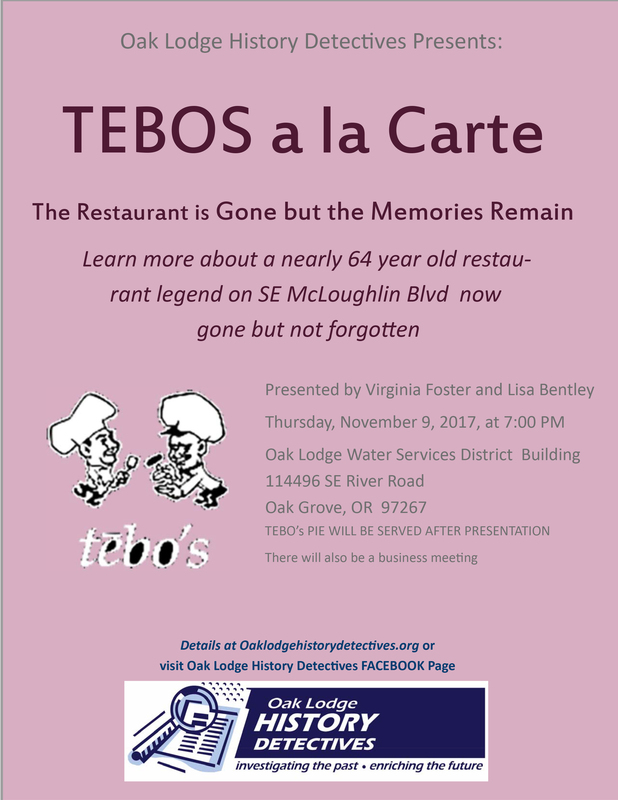 We'll conclude our evening with the program "TEBOS a la Carte", presented by Virginia Foster and Lisa Bentley which will be followed by refreshments of Tebo's Pies. 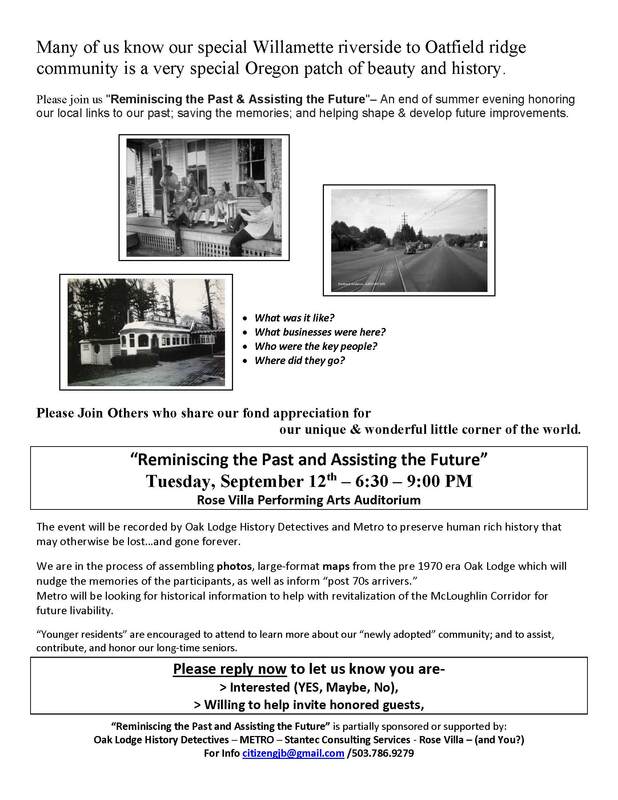 As announced in early September, OLHD’s September meeting was substituted by “Reminiscing the Past and Assisting the Future” — a joint program with Metro at Rose Villa on Sept. 12th. This was a very enjoyable and successful program with over 90 people in attendance. Our October meeting will be our annual “General Meeting”, as prescribed by our by-laws. It is at this meeting that we will be discussing how we want our organization to function as we move forward, and elect officers. OLHD has four Board positions: Chair, currently held by Mike Schmeer; Co-chair, currently held by Baldwin Van der Bijl; Secretary, currently held by Mary Smith Piper; and Treasurer, currently held by Pat Reinert. The terms of three positions have expired: those of Chair, Co-chair, and Treasurer. The Secretary’s position is at mid-term. Baldwin Van der Bijl has indicated that he will NOT be running for Co-chair again. Pat Reinert has indicated that she WILL run again. Having been Chair for 6 years straight I do not want to run for Chair again, but would be willing to serve as Co-chair under a new Chair. I am 100% devoted to OLHD but would like to take on a lesser role. I currently also serve on The Concord Partnership and Oak Grove Community Council boards, and am involved with the Oak Grove Historic Trolley Trail Association — all very worthwhile endeavors. I would like more time to do work on the OLHD website, do research, do interviews, and pursue my own hobbies. But I find that I can do few of those things while still serving as chair of OLHD, and performing functions that could be done, and ought to be done, by others within the organization. The success of any organization depends on a division of all the necessary duties. A dependence on two or three people is a recipe for failure. I have drafted a list of “perfect world” volunteer positions that I feel OLHD ought to have. I encourage you to bring a copy of this list with you to our meeting so we can discuss a strategy for moving our organization forward with a change in leadership, and I encourage you to consider volunteering. OLHD has become a community building fixture in Oak Lodge over the past 6 years, and indeed throughout Clackamas County. It would be a shame to see it flounder due to a lack of people willing to help out. Please join me on Oct. 12th to help OLHD develop a new strategy for moving forward. Instead, OLHD is excited to be celebrating the end of summer with a community gathering at Rose Villa on Tuesday, Sept. 12th. Please join us at Rose Villa for "Reminiscing the Past and Assisting the Future" at Rose Villa&apos;s Performing Arts Center, at 6:30 p.m. We&apos;ll have slides of long forgotten (or not?) businesses up and down McLoughlin Blvd. and Oak Lodge, maps, refreshments, and good company. We are working hard to invite as many long-time residents of Oak Lodge as possible to help us identify what businesses there used to be in Oak Lodge and where they were located. SPREAD THE WORD and help us grow the list of Honored Guests that were in Oak Lodge prior to 1970. Get them to come, and send us their names — they&apos;re bound to see old friends at this gathering. We could use more volunteers at this event. Please contact us if you would be willing to arrive early and help out. The Oak Lodge History Detectives will be participating in this summer’s Oak Grove Trolley Trail Fest with one of many booths. 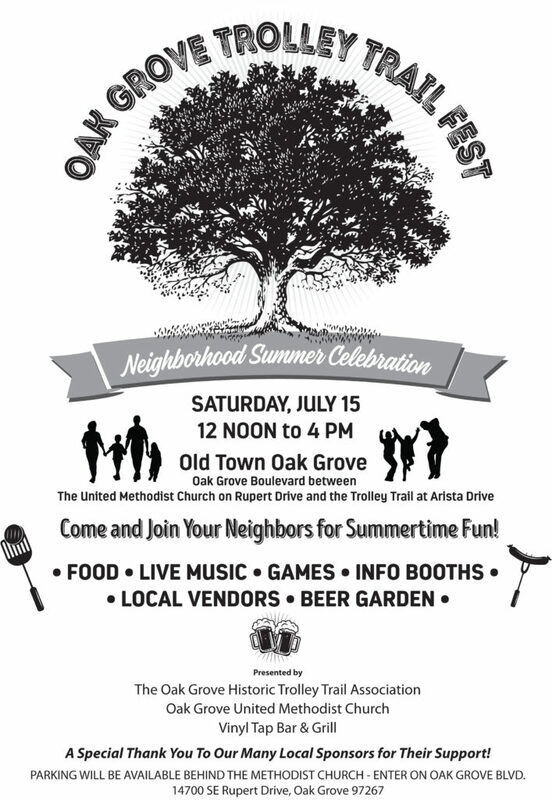 Mark you calendars — Saturday, July 15th from 12 noon to 4pm — for a fun filled Neighborhood Summer Celebration in the heart of Oak Grove, meeting your neighbors and learning more about your community and your community’s history. Our last meeting before the summer break will be on June 8th. In addition to reviewing recent history-related events and efforts we will be having Greg Hemer from the Milwaukie Museum talk to us about their Lot’s Loop Walk (as in Lot Whitcomb) project and how OLHD can play a small part in it. This is a walk around Lot Whitcomb’s Donation Land Claim in Milwaukie with several information stations with signage along the way. This is a fun project and we hope it will serve as a great example to help jump start a similar project in Oak Lodge. Join us June 8th and help us share our community’s history. Is it Spring yet? There are signs that the winter weather is behind us and Spring may have sprung. Lets keep our fingers crossed for many more rainless days in the days and weeks ahead. 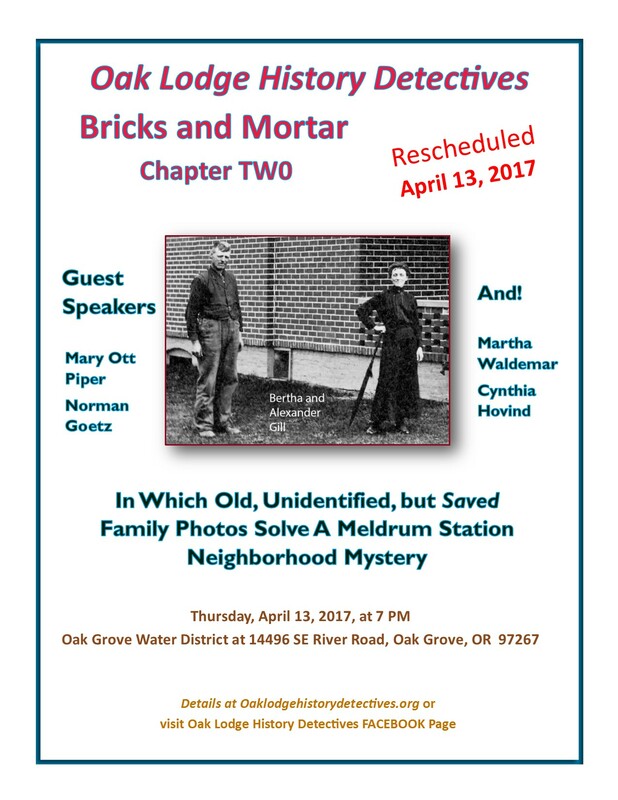 We will be meeting again on May 11th and, among other things, reviewing the "Bricks and Mortar Chapter II" presentation and continuing our Historic Houses At Risk discussion. The evening program is T.B.A. (as our stalwart President, Mike Schmeer, truly has been exceedingly busy). Join us May 11th and we&apos;ll continue our investigations into our Oak Lodge history. Find out how the History Detectives solved a local mystery! Please join us for another great history oriented evening. Join us on April 13th for what promises to be an informative and interesting evening. With a little bit of luck Old Man Winter will not interrupt our meeting in March! At our last meeting we spent a fair amount of time discussing At Risk Historic Houses and the things that can lead to their ultimate demolition. We will be continuing that discussion at our March meeting, focusing on things that OLHD might realistically do to promote interest and pride in our community’s historic homes, with the ultimate goal of encouraging stewardship in these houses – preserving them into the future. 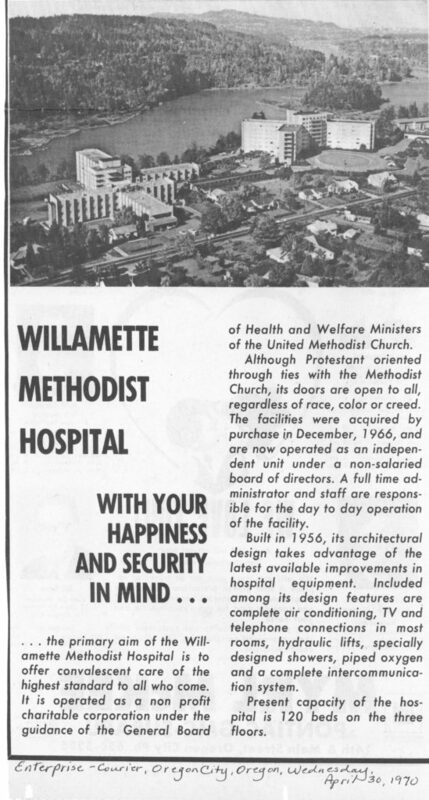 Our guest speaker for the evening will be Joyce Allmon, Willamette View Manor director of Communications and Community Relations, speaking about the History of Willamette View Manor. You now have a choice: Attend the hearing in person and testify if you wish , OR you can attend the OLHD meeting and provide WRITTEN testimony to the demolition hearing by emailing Linda Preisz at lindap@co.clackamas.or.us prior to March 9th, citing ZOOO9-17, Demolition of Oatfield House. You can also write Linda Preisz at Linda Preisz, Senior Planner, Clackamas Co. Planning Division, 150 Beavercreek Rd., Oregon City, OR 97045. Join us on March 9th for what promises to be an informative and interesting evening. They say “Try, try again”. And so we shall attempt to dodge Old Man Winter’s wrath this month and hold our first meeting in several months – cancelled previously due to unusually wintry weather. OLHD will be discussing these issues at our meeting, and considering how we might best move forward with proposing to Clackamas County more meaningful tools that would help to preserve historic resources in our community. As OLHD voted some time back to support the effort to preserve Concord School we will be updated on the status of The Concord Partnership’s final concepts for the re-purposing this building and its grounds. And for our evening’s program we will be hearing from OLHD member Mary Bailey presenting on the history of the “Portland Open Air Sanatorium“. Join us February 9th for what promises to be an informative and interesting evening. UPDATE: Cancelled for inclement weather!! We surrender!!!!! Old Man Winter is being RELENTLESS. Even if we don't get any more snow, what moisture remains on the roads will freeze tonight, and stay frozen tomorrow. So will parking lots, sidewalks, bike paths and driveways. It's just not worth the risk. Stay home, stay warm, and stay SAFE. Stay tuned for future announcements. Our next regularly scheduled meeting is set for February 9th, at the Oak Lodge Water District Office ( now the Oak Lodge Water Services ) offices on River Rd. @ Maple St.
Old Man Winter has been relentless thus far this winter. Our December meeting, at which we had planned to present “Bricks and Mortar Chapter Two” had to be canceled due to snow and ice. Two weeks later the Friends of Oak Lodge Library celebration was held at Rose Villa amidst a significant snow event, resulting in a poor turnout. And now we’re heading into a significant cold spell with the possibility of some snow. Though it is too early to predict with any degree of confidence this weather pattern suggests that our January meeting could get snowed out again. After the December snow-out OLHD had planned to postpone “Bricks and Mortar Chapter Two” until the January meeting. But in light of the wintry weather we’re having it has been decided to postpone that indefinitely until we are assured of decent weather – probably spring. We don’t want anyone missing this great presentation due to inclement weather. And we don’t want people venturing out into bad weather just so they don’t miss this presentation. So our January meeting will be held January 12th – – – – Weather Permitting – – – – the evening’s program “To Be Announced”. The postponement of “Bricks and Mortar Chapter Two” means yours truly has a short window to come up with a backup program. Please keep an eye out on our OLHD website, and Facebook page, for cancellation notices if that becomes necessary. An attempt will also be made to send out a general cancellation announcement via email. We’ll keep our fingers crossed that Old Man Winter gives us a break, and we’ll see you January 12th.